Globally, composites is a USD 36 billion market, and is expected to grow at around 10% y-o-y given the potential user sectors' market (Aerospace & Defence, Transportation, etc.) and regulatory drivers (emission norms, safety). 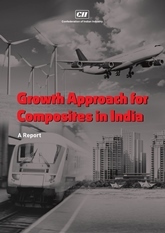 However, composites adoption in India has been relatively muted with market size less than USD 400 million due to limited demand side maneuverability (lack of awareness on composites) and supply side issues (poor technology adoption, lack of value chain ecosystem, delivery capability, cost, etc.). The per capita consumption of composites in India is around 0.25 Kg, against 2.2 kg in China and 10 kg in US. This study done by CII identifies the drivers of demand for various sectors and makes specific recommendations for select sectors. It is evident that there is a need for creating appropriate awareness to develop applications to drive demand; additionally, Government intervention especially in sectors such as Aero Space and Defence, where by incorporation of appropriate clauses in the agreement, tangible measures to support policy initiatives such as Make in India and self-reliance in Defence could substantially support the Industry. The study recognizes that India is making efforts to leapfrog on the technology front in certain applications by high usage of composites – for example, in light Combat Aircraft (such as Tejas). Even though India has a significant labour arbitrage, due to limited capabilities of the existing players in this sector and global deals entered into by large OEM Customers such as Airbus and Boeing, Industry’s ability to use it to advantage has been limited. Through appropriate collaborative efforts of the Industry and Government to build an eco-system for enhancing supplies to such majors through creating of appropriate capabilities and capacities, the study believes that the Industry could grow substantially. Creation of standards and codes for Building & Construction, rewriting specifications to provide competitive advantage in Marine and Rail Transport have been identified as being of importance. Driving quality of products through appropriate systems in manufacturing entities and supporting such efforts through third party testing facilities and upstream investments for easy raw material availability through Government interventions could see double digit growths for many years to come.